Please donate to help out our union members and their families in need. Thank you! A message from Laurie A., Santa Clara County Worker: "On February 21, the Coyote Creek overflowed it banks and flooded the mobile home park that I live in. My elderly mother, daughter and I were forced to evacuate. My mother has some medical issues that would make it very uncomfortable for to stay at an overnight shelter, so I paid for a hotel. I really couldn’t afford the room but had no choice. Our park was without gas, electricity, and water for five days. We had to throw away most of the food in our refrigerator, and everything in the freezer. We can’t afford flood insurance so I cannot get that money back. 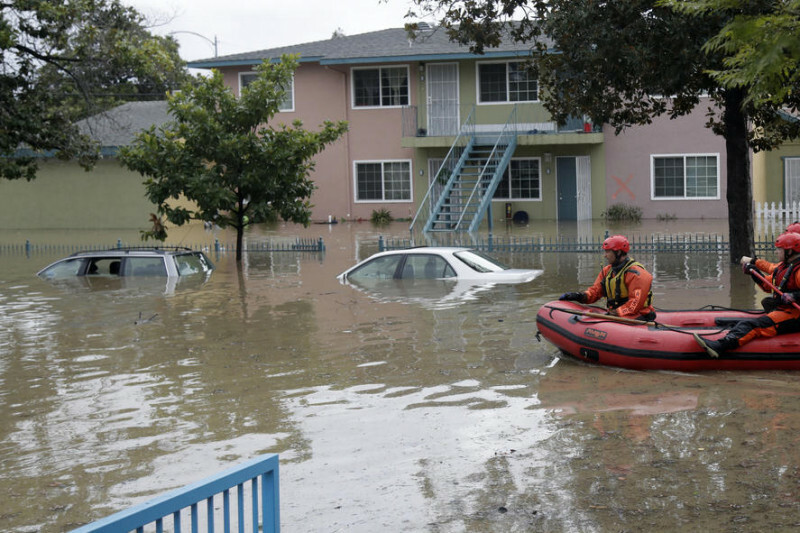 Please consider donating to our SEIU 521 disaster relief fund to help our brothers and sisters who have lost their cars and furnishings, and in some cases their homes. Thank you." "I have worked for the Department of Family and Children’s services for 26 years as a social worker and a social work supervisor. My small home is on the East side of the Santa Cruz mountains by a beautiful creek. This has been my source of peace and rejuvenation and the place I have raised my daughter for the past 26 years. Last year I was in the center of the Loma fire and almost lost my home. This year we have had so much rain that there is now a landslide that is up the creek from my home. I have been notified by the County that it may slip and come down the creek at any time taking out my home. I am disabled and cannot move quickly and so have been unable to live in my home. I do not know when or if I will be able to go back. I have been living with friends but will soon need to rent a room from someone if I cannot go home. I still have a mortgage to pay and my insurance does not cover land/mudslides. I am heartbroken at thought that I could lose the place that has been my place of refuge. Any help at all would be appreciated as I cannot afford to pay mortgage and rent, but I may have no choice." Just wanted to continue thanking everyone who is contributing to this cause (JN, thank you for understanding my quest. Truely appreciate your donation). Please keep this reposting and know we are working on the logistics for recipients of the fund. Deepest gratitute. I am sorry but this is no time nor is this going to be a forum for negative comments about MY UNION. This is about what is going on due to the floods, I am asking that if you have no encouraging nor good words to say, please find an alternative forum. This is my idea as a SEIU Negotiator, Steward, Member, Co-worker and FRIEND of the ones who are dealing w/damages and need. I, on the other hand will continue to reach out to my brothers & sisters of every Region/County and extend non-members to give any amount you can, every bit wil help another human being regardless of any union affiliation or not. This is an act of kindness, a gesture of humanity and its all for reasons of the heart. No Room For Political / Non-Political BS. I also continue to appreciate those of you who contribute and please keep reposting this because our members continue needing help. Thank you from the bottom of my heart. Wow, have been sick so havent been on this but we have made more movement forward and almost at the goal set. I do know the workings to distribute are being finalized as well so have limited time left to donate. Please repost as we are so close and/or donate. Thank you all so much for the donations this is going to help members more than you know. Much appreciate the kindness. Im still trying to reach this goal... help me out so we can start doing the REAL work. Our members need help now, today and I can only hope people start to see that. I also know people are hearing the millions private organizations have raised and that FEMA finally stepped in but does anyone realize the number of homes and people are in need? The cost to rebuild/repair? The cost to help w/temp housing, food & clothes. Have any of you experienced being homeless, cold, no money, no means yet work, have families, bills...and so on. I havent to the extreme described but have had my share scare and if I can help a few, couple or one never have to experience that for any extended period of time, then I will try to do what I can or give what I can. Find the compassion within you... Thank you. How sad to see that SEIU wants other people to step up and help out its own members. They spend hundreds of thousands of dollars on needless training travel and political nonsense. For what SEIU brings in monthly from dues this is insulting to me and I'm no longer a member of SEIU. May ur needs be met and relief come ur way. God bless and keep u safe.